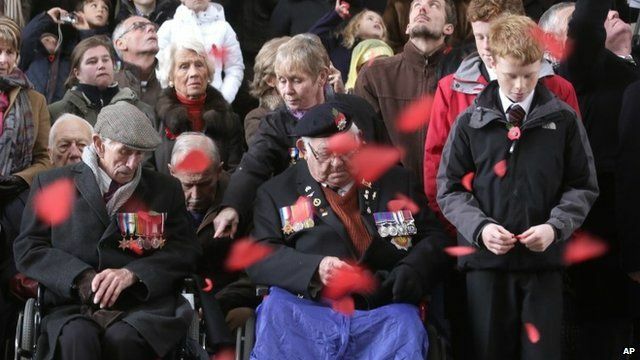 Armistice Day: Poppies fall on Ypres Jump to media player The anniversary of the World War One armistice - signed 95 years ago - has been marked at the Menin Gate memorial in Ypres. 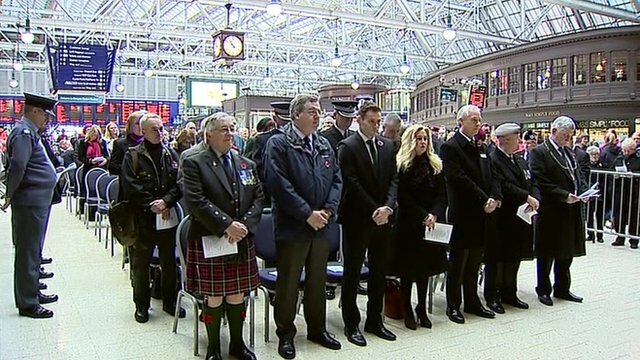 UK falls silent for Armistice Day Jump to media player The anniversary of the World War One armistice has been marked across the UK with a two-minute silence. 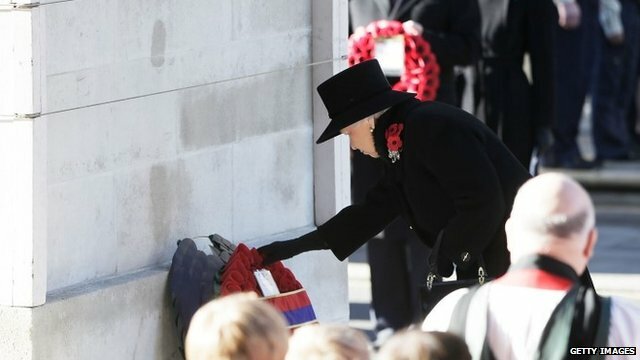 Queen leads Cenotaph memorial service Jump to media player More than 10,000 veterans and civilians have joined members of the Royal Family and Commonwealth leaders for the annual Remembrance Sunday service at the Cenotaph in London. 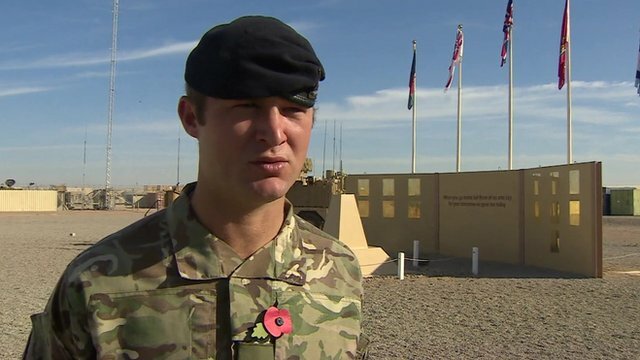 Final memorial at Camp Bastion Jump to media player British troops based at Camp Bastion in Afghanistan are to hold their last big memorial service on Sunday before they withdraw in 2014. Poppy girl's emotional reunion with dad Jump to media player Megan Adams, a member of the group Poppy Girls, was shocked when her serving father turned up to her performance at the Royal Albert Hall. 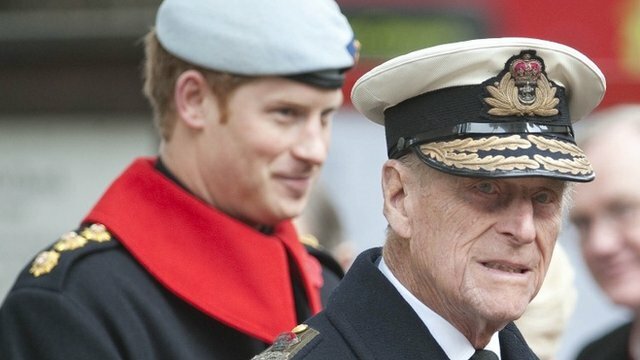 Philip and Harry at Remembrance event Jump to media player Prince Harry has accompanied the Duke of Edinburgh on his annual visit to the Field of Remembrance at Westminster Abbey. Queen opens forces charity HQ Jump to media player The Queen has opened the new London headquarters of an armed forces charity in London. 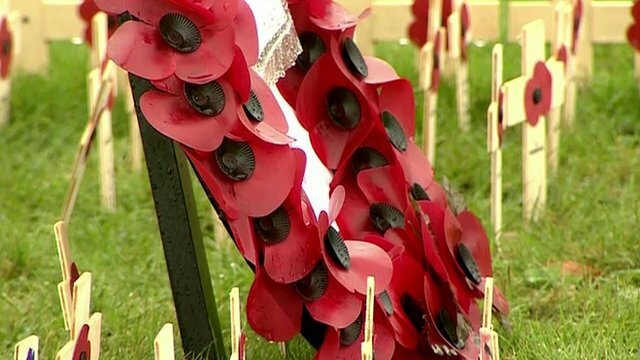 The anniversary of the World War One armistice - signed 95 years ago - has been marked in Ypres. A memorial service was held involving the laying of wreaths and thousands of poppies were dropped at the Menin Gate.